The Agency is a three-way collaboration between Contact Manchester, Battersea Arts Centre and People’s Palace Projects. It draws upon strong community connections to work with vulnerable young people who will benefit from joining the creative processes of Contact, BAC, and now other participating partners across the country. The Agency model has its origins in Brazil, drawing inspiration from Agência de Redes para Juventude. It uses creativity as a force for personal empowerment, with trusted community advocates recommending the agency to young people between 15 – 25 who will benefit. Battersea Arts Centre’s (BAC) scratch approach has delivered innovative theatre since 2003 and is increasingly being applied beyond the stage. The essence of scratch; iterative creation developed through a cycle of audience feedback and testing, underpins this collaboration with participants of The Agency being encouraged to test and refine raw ideas. They develop ideas throughout the programme, have to garner support from their local community (at least 100 signatures) and then, after some development, decide which ideas go forward by pitching to a panel of experts. Regardless of whether their idea is chosen, the young people get behind the selected ideas to develop them further, with BAC’s support. As well as the idea itself, what emerges from the relationship is the participants having their own agency, to shape their lives with more confidence and awareness of opportunity. The social benefits of The Agency are clear, with participants gaining valuable life skills, and enjoying each other’s success: celebratory meals and events are an essential element of the relationship. BAC act as facilitator in this relationship, offering guidance, skills and connections. Crucially, The Agency currently offers a weekly stipend to participants, in order to ensure that they feel valued, and that no one is prevented from participating financially. Artistic Director David Jubb points out that this also helps to validate and equalise the relationship between the organisation and individual, making it more sustainable for future growth. As part of BAC’s overall ethos, The Agency seeks long-term relationships, rather than one-off interventions, with the creative process of testing and prototyping being as important as the end product. We interviewed one participant, Osmond Gordon-Vernon about his participation. When Osmond joined the Agency, he wanted a creative way to explore the life choices him and his friends had ahead of them, “what makes me who I am”. Conscious of the challenges and pitfalls of life on his estate, he developed a board game Life’s What You Make It that physically encouraged stepping back and considering the consequences of your actions. 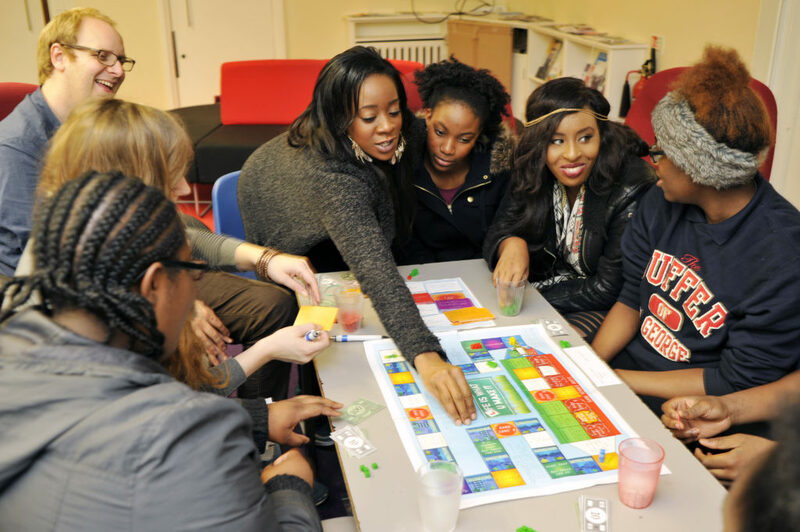 Rather than using digital media, Osmond liked the idea of a physical board game that encouraged a group of players to interact around a table. Embracing the scratch philosophy, Osmond has tested Life’s What You Make It at every stage with peers such as pupils at the Harris Academy and his friends, reiterating each time. He took photos of players in action and set questionnaires to get feedback. Becoming skilled on Adobe Creative Suite and learning marketing and business skills has broadened Osmond’s perspective, he’s keen to go to college and act as mentor to others on his estate. In the next phase of Life Is What U Make It, Osmond is developing the game as a teaching resource. BAC Productions are supporting the development of a programme of schools activity that can be rolled out across London, with the ambition of supporting young people to make positive life choices. Using BAC’s scratch process, he will test the programme in local schools and Pupil Referral Units. With feedback from this scratch, necessary changes will be made to the board, creating robust evidence demonstrating the impact of the programme. BAC will work in partnership with Osmond to seek match funding for this next phase of development. The Agency was initially funded by Calouste Gulbenkian Foundation and is currently supported by Big Lottery Fund’s Growing Great Ideas. Come and work with us! Paid work opportunity for 16-25 year olds in Islington.